Executive Publisher Charles N. Gerencser just told View From a Loft that some early criticism has them considering exploring the other side of the river. Bravo. When introduced and the "Eastside" culture was established as the ethos, yet not cover what East L.A. has in style or development, it almost felt like an identity was being taken away. 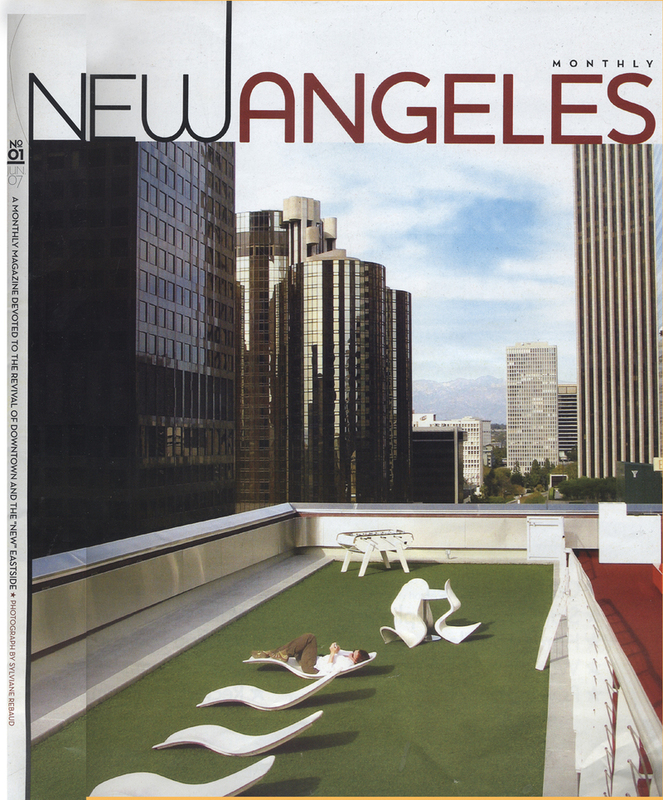 What I do like about this publication is it can help evaluate what is the Eastside vs Westside so people can make their own borders. Another nice touch is listing websites as credited references at the end of most articles. 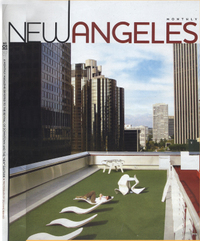 According to Gerencser, the Los Angeles blogging culture is seen as an asset for content. Who knew? Not all the articles are up on the website, but will be tomorrow. Branch Manager Scott McLennan does the honors for the new FedExKinko's located at 181 S. Central in Little Tokyo. 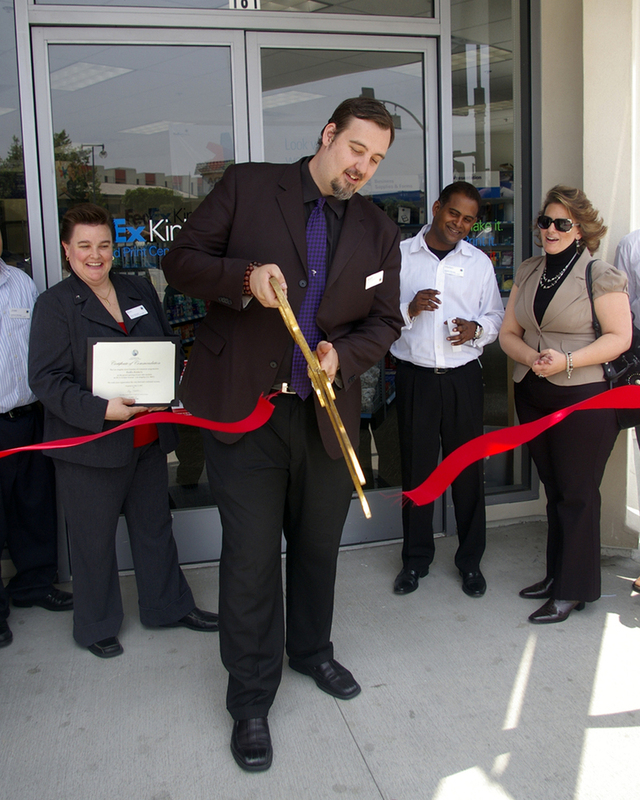 The smaller store offer large scale copies, banners along with the usual copy services. Also, they carry a small collection of items for the "mobile professional." Working artists who sign up as a business may qualify for a discount. There is no validation for parking. 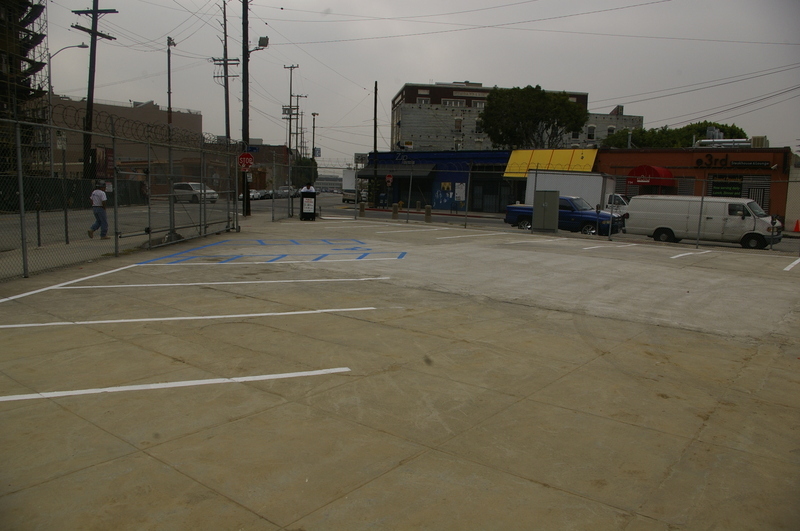 The small triangle parcel at Rose, Traction and 3rd opened today as a 16 space parking lot. 15 if you count the attendant taking up one space. Just noticed that ViewFromaLoft is a nominee for best blog at LA Downtown News, which explains why blogdowntown invited the competition to join him. Last day to vote is today. Conspiracy! Despite that, head over there for a DotDotDash, plus help create a pizza named after a blog. 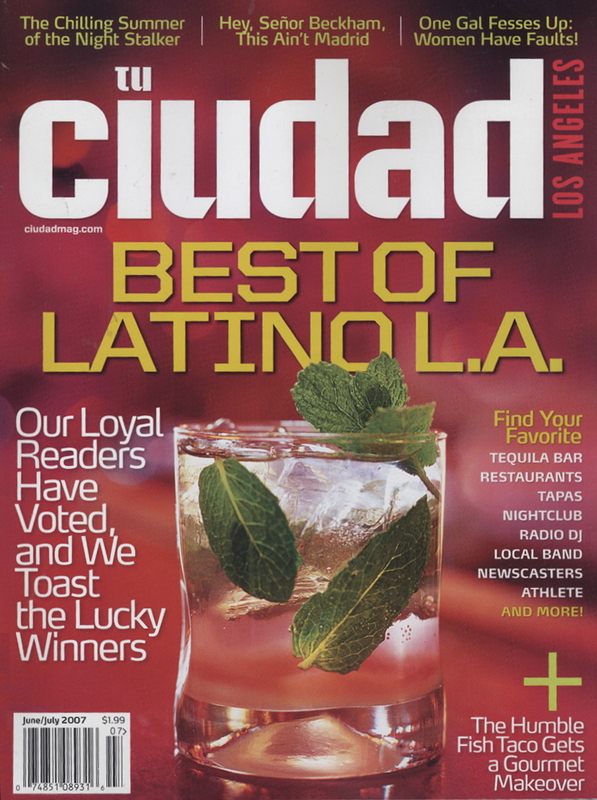 Best (and Worse) of Latino L.A. 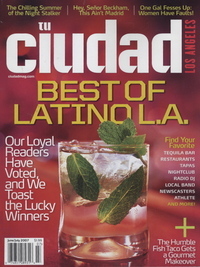 The June/July 2007 issue of tu ciudad arrived today and inside is the 2nd Annual Best of Latino L.A. Curious to see that this issue has a look back at Richard "The Night Stalker" Ramirez by Dennis Romero. No word if the readers had an alternative selection for "Latino Most Likely to give you Nightmares." Another Community Comes Together: Next to a life size Jabba the Hutt, "Elvis Trooper" thanked everyone for attending the Star Wars 30th Anniversary Celebration, then mentioned they just sold out of the Yoda figures at this booth where he was holding court. 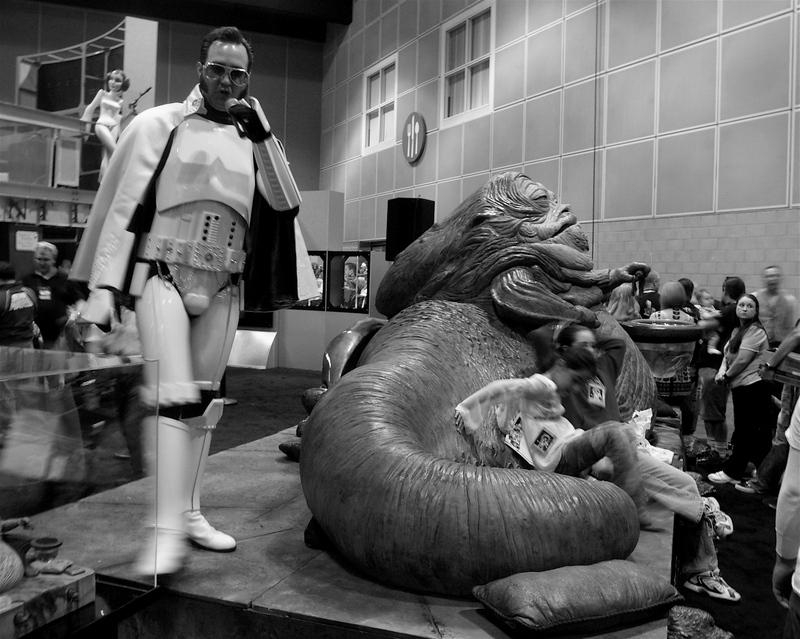 The event––held at the Los Angeles Convention Center––filled the downtown hotels with after parties and had stormtroopers wander Figueroa. Last Friday was designated "Star Wars Day" by Jan Perry at City Hall. From behind the bushes at Elysian Fields Picnic Area, here's a shot of who was rumored to be anonymous blogger LACity Nerd as he/she waves to the 26 attending the blogdowntown picnic. Here's some pics while Eric is doing his POV at the mothership. Pictured: ShainLA posing as LACityNerd. After the jump: 9th District Councilperson Jan Perry and Central City East blogger Don Garza waving goodbye to attendees / Bloggers and friends linking offline / Cathy takes in the view from a hill. 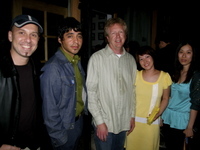 Saturday night's opening night reception for microLA Gallery (12008 E. 7th St) Citizen LA publisher George Stiehl with gallery owner "Ang" and three of the 17 exhibiting artists, Robert Kross, Megumi Katumoto and Sidnei Truong. Two weeks ago, I was invited by Eric the Thread to join Dave Bullock as a contributor to blogdowntown. "Trying to take out the competition?" I asked. I agreed anyway. View From a Loft will keep going, of course. While doing some early groundwork this week for blogdowntown, I met more people who read my blog. Frankly, I'm impressed by the company I keep, so to speak. Now, off to a picnic.